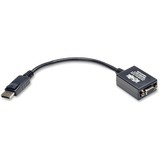 Tripp Lite's P136-000-UHD-V2 Displayport 1.2 Male to HDMI Female Adapter allows you to connect a computer with a Displayport output to a HDMI monitor. 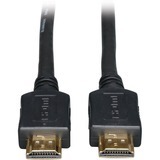 Supports computer video resolutions up to 4K x 2K @ 24/30 Hz (Ultra HD). 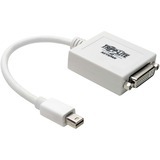 It is an active adapter, converting both Single-Mode and Dual-Mode (DP++) DisplayPort output. 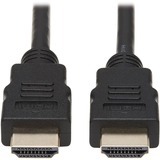 It's perfect for use with graphics cards, such as AMD Eyefinity, that do not output DP++ signals. 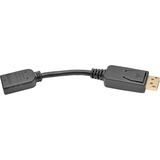 Adapter is Plug-and-Play and requires no drivers or software. 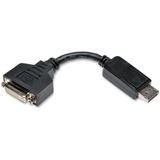 Backwards compatibile to previous Displayport versions (1.0, 1.1, 1.2). 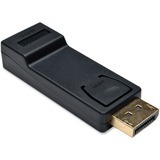 Fully molded ends ensure long life enjoyment. 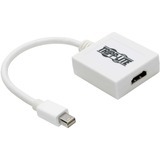 Tripp Lite 6in DisplayPort to HDMI Adapter Converter DP to HDMI M/F 6"
Tripp Lite 6in Mini DisplayPort to DVI Adapter Converter mDP to DVI-I M/F 6"
Tripp Lite 6in Mini DisplayPort to VGA Adapter Active Converter mDP to VGA M/F 6"
Tripp Lite 6in Mini DisplayPort to HDMI Adpater Converter mDP to HDMI M/F 6"